Can’t decide between a chocolate cupcake and a cheesecake? Black bottom cupcakes are the answer. 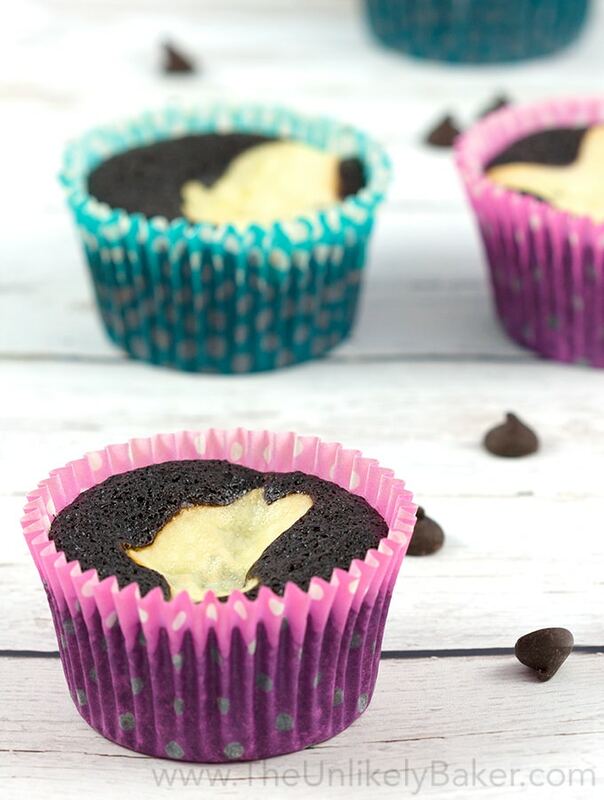 Rich dark chocolate cupcakes with a generous dollop of cream cheese and chocolate chips in the centre – these cupcakes are hard to beat! Happy Halloween! This is not a Halloween recipe though. Just thought I’d say that because, you know, it is Halloween. What this is is a dang good recipe for black bottom cupcakes. What are they? Well, if you can’t decide between a chocolate cupcake and a cheesecake, these are the answer. Imagine an ooey gooey chocolatey cupcake with a creamy cream cheese centre. That’s what black bottom cupcakes are. 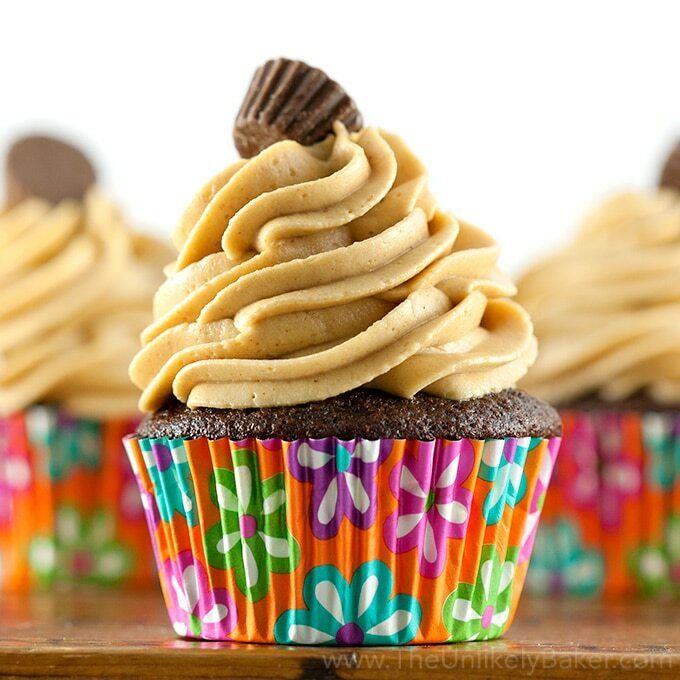 Add chocolate chips to the mix and you have cupcakes that are so good they don’t need frosting. Frankly, I didn’t even know what black bottom cupcakes were before I stumbled upon the recipe while looking for something I could make with my 1 block of cream cheese that was about to expire. 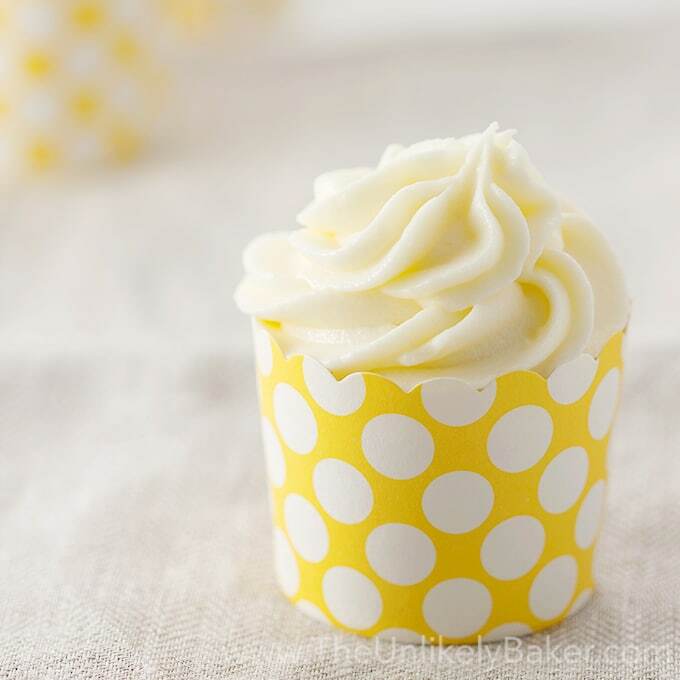 Cheesecakes and cream cheese frosting typically need at least 2 blocks so this recipe is perfect. I did make my version more chocolatey because chocolate. 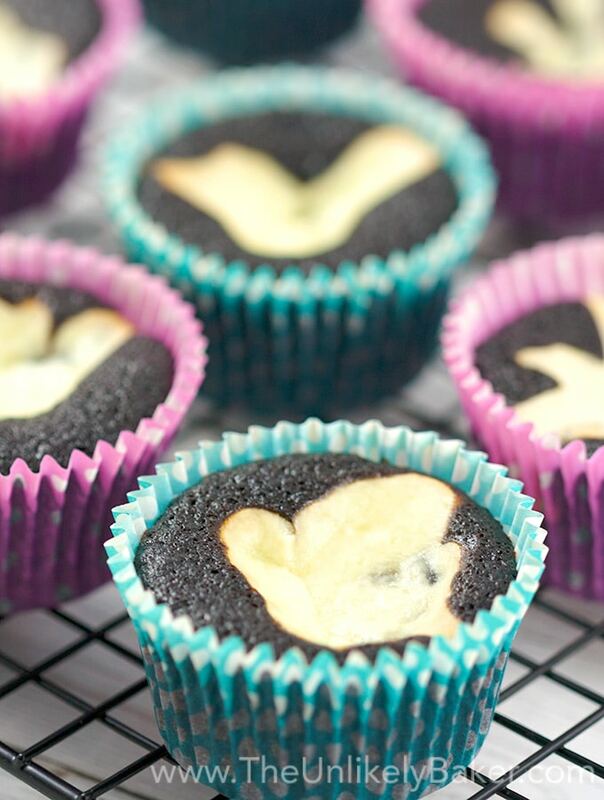 I haven’t had them before so I had no expectations going in but let me tell you – if you ever could not decide if you wanted chocolate cupcakes or cheesecakes (though what a happy problem that is), whip up a batch of black bottom cupcakes. Then you can have both! Decadent chocolate cake, a rich cream cheese centre, chocolate chips for texture (and more chocolatey goodness, of course)…these cupcakes are so good you cannot possibly eat just one. Hope you can bake some this weekend and on that first bite, enjoy the glorious fact that at that moment, you are having your (cup)cake (and cheesecake) and eating it too. Can’t decide between a chocolate cupcake and a cheesecake? Black bottom cupcakes are the answer. 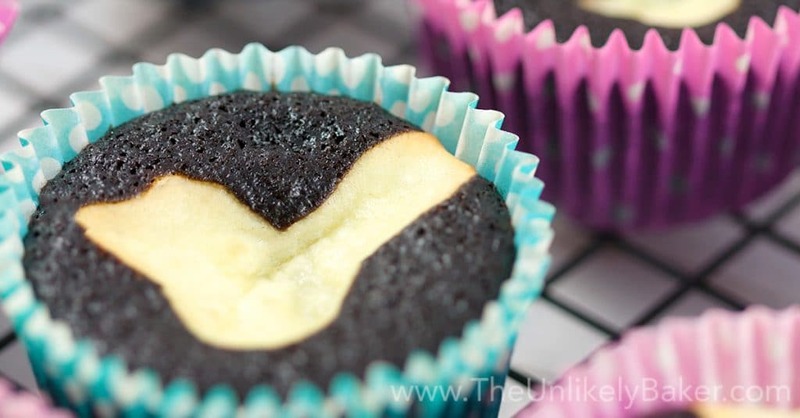 Dark chocolate cupcakes with a rich cream cheese centre. Preheat oven to 350F. Line baking pans with cupcake liners (this recipe yields 24 cupcakes). Set aside. 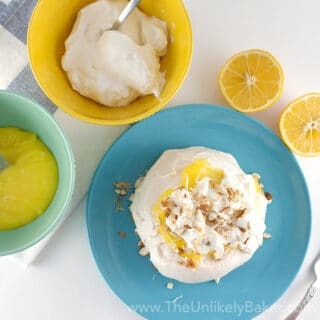 Using a handheld electric mixer or a stand mixer fitted with the paddle attachment, beat the cream cheese, egg, 1/3 cup sugar and 1/8 teaspoon salt on medium high speed until light and creamy (about 2-3 minutes). Remember to scrape the bottom and sides of your bowl. Stir 1 cup chocolate chips until incorporated. Set aside. In a large bowl, combine 1 1/2 cups flour, 1 cup sugar, 1/3 cup cocoa powder, 1 teaspoon baking soda and 1/2 teaspoon salt. Add 1 cup coffee, 1/3 cup vegetable oil, 1 tablespoon cider vinegar and 1 teaspoon vanilla and stir until fully combined. The batter will be very thin. Transfer the batter into your cupcake cups filling them about 1/3 full. 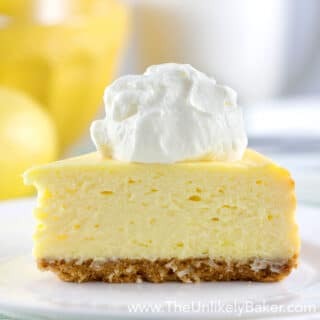 Add a heaping tablespoon of cream cheese filling in the middle and bake for 20-30 minutes or until you see the sides of your cream cheese filling start turning brown. Take out of the oven and cool in the pan for 10 minutes. Transfer to a wire rack to cool completely. You will notice the middle will puff up in the oven but sink as it cools. This is OK.
(Recipe adapted from All Recipes). Did you make black bottom cupcakes? Tell me about it in the comments section below. And what did you do on Halloween? I’d love to hear all about it. November (yes, it’s November tomorrow!) is the start of holiday baking craziness season on The Unlikely Baker so check back in for some amazing holiday ideas and recipes. Subscribe now so you don’t miss any of the fun. I promise I don’t spam. I hate spam too. I don’t want to make, i just want to eat only. 😛 Looks delicious. LOL I totally get that Savita! 🙂 I’m like that sometimes too. Usually when I see dishes piled up a mile high after baking! They look amazing! I never thought you could have both cupcakes and cheesecakes in only majestic … cheesecup? It looks so good and it sounds so delicious! I can imagine how great and chocolaty it tastes. This looks soooo good. Wish I could have on of those right now. I love the combination of cream cheese and chocolate, sounds like the perfect mix for me. Very nice article on cupcakes. I have always wondered how theses were made this way. Take care! I bet I’ll try this recipe! You made beautiful photos too 🙂 I’m totally in love in cupcakes and yours just made me hungry haha! Great post! That’s fantastic! If you cannot decide, have both! And what a creative way to have both 🙂 I love the idea – nd the cupcakes! That’s what I think! Haha 🙂 Thanks Tiina! These are so pretty and delicious looking! I can’t wait to try them! I have to try these. They look so rich. I’m sure they are as delicious as they look. 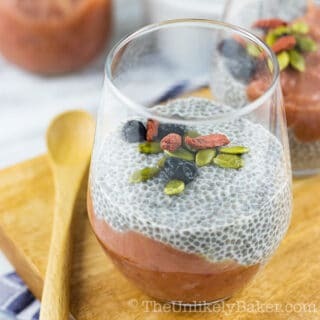 Oh WOW this looks brilliant and super divine!! Ca’t wait to make it!! Wow these sound amazing! I love that you don’t have to choose between the two, you can have both, yummy! Wow you have real talent! I wish my cupcakes would come out half as good as yours. These look incredible! Aw thanks Robin! They are so precious 🙂 And hope you get to try these cupcakes soon! I’ve never heard of this kind of cupcakes before! I do think that my husband would LOVE these. He loves chocolate and cheesecake! 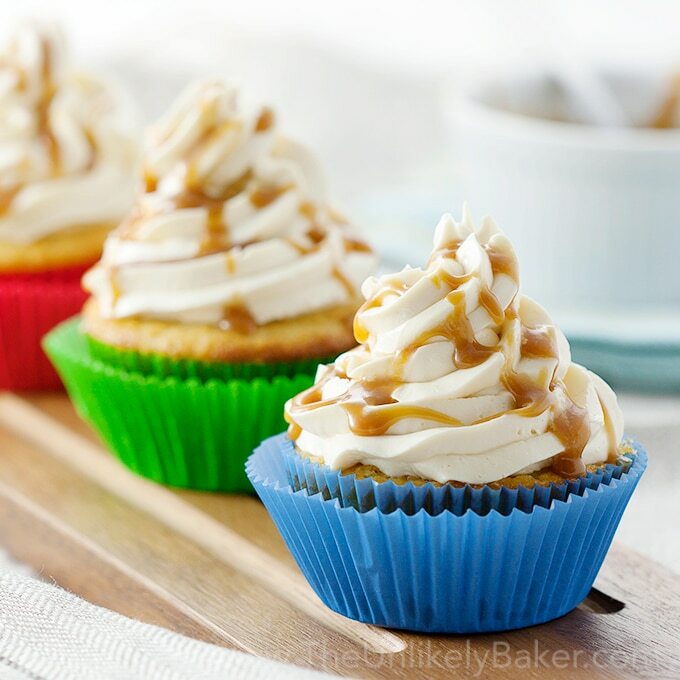 Oh my these cheesecake cupcakes look amaazingg! I’m obsessed with cheesecake so to have it with a cupcake is like my heaven! I have to try this recipe. Our daughter love those cupcakes and cheese cake, now we can try black bottom cupcakes for her. She will definitely like this. Aw that’s nice! Hope she likes them! Those are pretty awesome and they’re perfect for parties as well, especially this coming month! How can you say no to a cupcake that also doubles as a cheesecake! This is my kind of dessert! A cross between a cheesecake and a chocolate cupcake… wow! I must admit it’s pretty awesome! 🙂 Now we don’t need to pick one over the other. My husband asked this morning what’s for dessert tonight (the man loves his dessert!) and I just realized that I have all the ingredients to make these – I think I know what I’ll be making! Nice! It’s a sign 🙂 Hope you guys like them! Thanks Erin! How cute are these. I’m definitely going to try them at some point. My mouth is watering just looking at them. Awesome! Hope you like them. Thanks Ami! OMG! They look delicious! I am definitely making this recipe. Thank you. Glad to hear that! Would love to hear how it goes. Thanks Kelly! Chocolate AND cheesecake sure sounds good to me. I love them both, so this cupcake will be one delicious treat! mmmmm! I will have to pass this on to my sister! She LOVES baking. I like that they are black and white: perfect for Halloween! Thanks for sharing! You you guys like it 🙂 And hope you had a fun Halloween! Oh my goodness, these might be my new favorite treat! 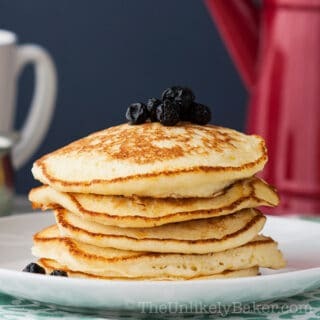 I will definitely be whipping up some of these soon. 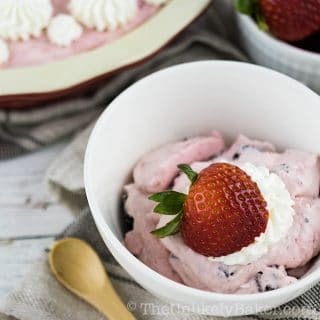 This is the perfect marriage of two desserts! Chocolate cupcakes and cheesecake are both delish on their own, but when combined?! Oh mama! Chocolate and coffee flavors with cheese cake. Oh my goodness, over the top! Thanks. Yum…this is like two desserts in one….does it count as one dessert? YES…I think this recipe is a winner and it’s going in my recipe box. Two birds in one cupcake! 🙂 Thanks Ali hope you like them! These sound and look so good! I had never heard of these kinds of cupcakes bbefore but YUM! Me neither but when I first made them I was like I don’t care if you have a weird name I’m eating you lol! Thanks Neely! Hope you’re having a fun Halloween! How fun! 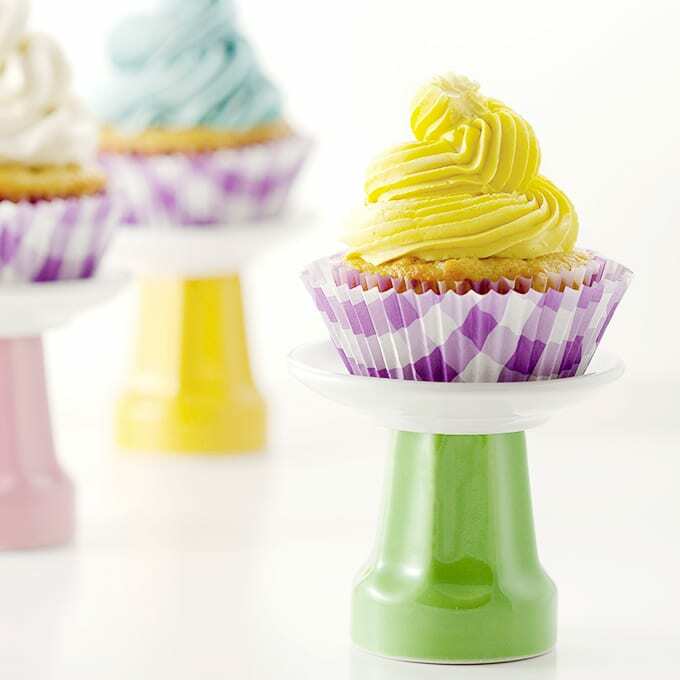 I love cupcakes AND cheesecake so these will be happening in our house soon! Nice! Hope you like them. Thanks Kim! 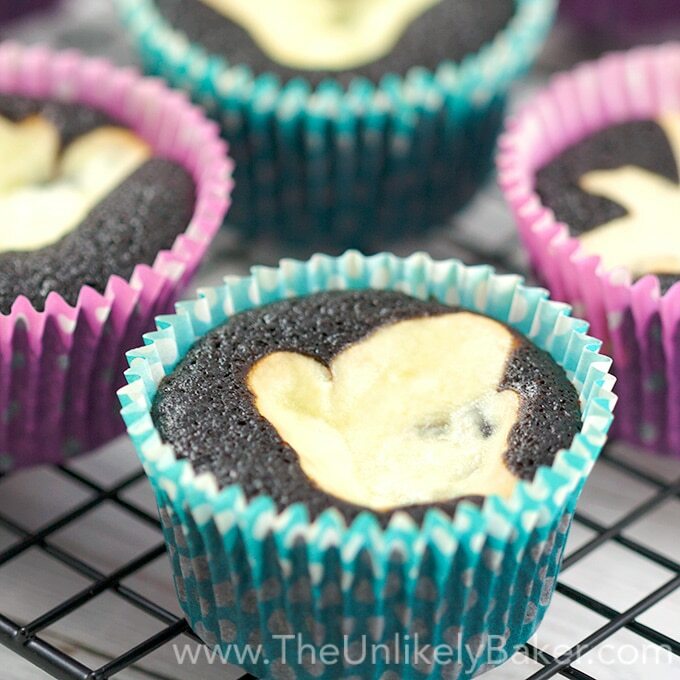 These look super delicious, I will have to try to make these black bottom cupcakes with the kiddos! Wow! Those sound simply amazing! Giving these a try soon! This sounds amazing! I bookmarked this to try soon. I always love chocolate chip cheesecake, so I’m sure I’d love these! These look delicious but I wouldn’t save it for just Halloween. I can use this recipe for any brunch or theme party I’m throwing. 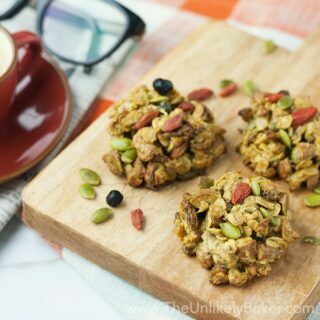 Oh absolutely 🙂 They are perfect as a snack or even for breakfast. Thanks Anita! Hahaha….we’ve all been there with cream cheese that’s about to expire. I buy a bunch on sale and then it sits there lots of times until the last minute 😀 My go to is typically dip, but this is awesome too! Best of both worlds, indeed! You know what that cream cheese on top kinda reminds me of? A dove shape. I don’t know why…just do! I would gladly trade you my Halloween candy for a few of these. Have a good one, my friend!! Haha yeah, especially since they always do a buy 2 for $6 or something! And you think sure I’ll buy lots I can make 100 cheesecakes in that time LOL. A dove? Interesting! I thought it looked like a heart teehee. Hope you’re having a fun Halloween! Okay, it’s barely 10 in the morning and now I want cupcakes LOL These look delicious! That’s not such a bad thing lol 🙂 Thanks Kristen! I’ve made something very similar but haven’t heard of this name for them. What purpose does the vinegar serve? Gosh, these do look absolutely delicious, like a power couple! What could be more perfect than combining chocolate and cheesecake. Very few things! 🙂 Thanks Tania, it’s really hard to go wrong with this one.